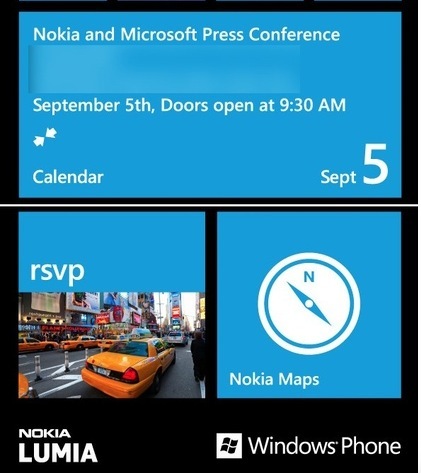 Microsoft has sent out an invitation to a September 5th Windows Phone event in conjunction Nokia, reports The Verge. The event is likely going to see the announcement of the first Nokia Lumia Windows Phone 8 devices. It will be held on September 5th at 9:30 A.M. in NYC, which seems like fortuitous timing, as it’s the week before Apple’s rumored September 12th event, at which it’s expected to release its next iPhone and maybe even an iPad mini. We liked both the Nokia Lumia 800, which we felt was a decent contender for the iPhone, and its larger successor the 900. But neither device really caught fire with consumers, especially in the U.S. The announcement of a Windows Phone 8 device will be Microsoft’s stab at pushing its new Windows paradigm across all platforms, with its desktop OS, its Surface tablets and new phones.